Much like the Renegade Row (which we covered last week), a push-up to single-arm support is a terrific total-body exercise. First and foremost, you get the benefits of reaching which I’ve touted numerous times here. But furthermore, when going into a single-arm support position you really overload the core, and stress its ability to resist rotation. In this short video, I cover how to get the most out of this awesome exercise. Take the feet out a bit wider than normal. If you’re too narrow it’s going to be incredibly difficult, especially early-on. Before going into the single-arm support, make sure to get a full reach at the start/finish of each rep. I will often cue an exhale as well (ala the breathing push-up), which will help get the abs and core into an optimal position. 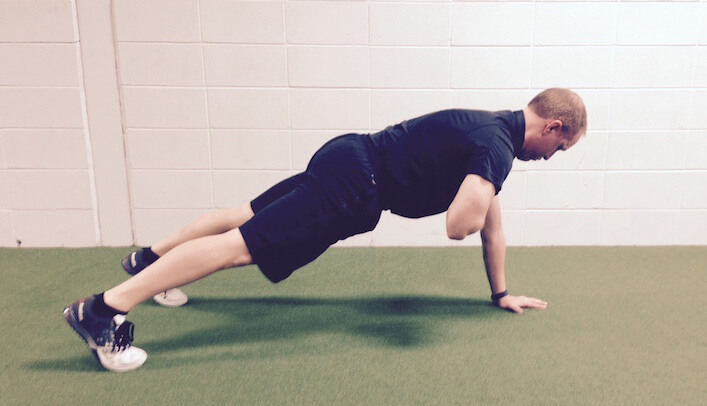 Next time you’re in the gym and want a fun push-up variation, give this one a shot. Enjoy! Great post, Mike. Renegade rows were definitely a challenge for me when I tried them last week (in part because the kettlebells at my gym have a very small base and consequently are very unstable). But doing this pushup variation will definitely provide me with some extra reaching that I’ve wanted to add in to some of my exercises. Thanks for sharing great content as always.